I've had this idea for a few years and wonder if it would be feasible. Rather than simply recycling bottles and bags in blue bins, if there could be a way to melt down all types of plastic and mold them into large bricks, like big Lego. It sounds silly, but these could be used to build or insulate just about anything. Is this idea remotely possible? Even if there was one machine at each recycling depot where you would normally dump plastic, you go and make a brick once you have enough to melt. Then you can either take them home and collect them, or donate them to be used for charitable projects. At present the plastic waste stream can be diverted into multi-color goo mixed with wood chips and be extruded into synthetic fence posts. Ugly as sin, but better than nothing, and I think that for sheet goods (bags) this is pretty good. Styrofoam is separated from the waste stream by density. You would also get used grocery bags. Don't think that will matter. Material is shredded to a uniform size, and cleaned of food residue. Dirt is ok.
Material is sprayed with a solution of acetone and water. Acetone is a solvent (may be other better or cheaper ones) This dissolves a surface layer of the styrofoam, leaving it sticky. Chips are pressed into a continuous molder that molds the knobs and sockets into the block. In the molding process 3/8" x 3/8" (size needs testing) grooves 2" apart on the long faces, parallel to the long dimension. The blocks are cut into full and half length blocks. At this point the blocks can be used for building. The grooves allow stucco or plaster to be sprayed on for fireproofing. Predrill vertical holes 2" in from the surface. This will allow vertical wire runs. Put horizontal groove 2" in from the side, also for wiring use. Coat 5 faces to prevent condensation inside the block. One face is left open so that trapped water can get out. In a heating climate this would be the outside face. Add colourant to the mix so that you can get colours other than dirty white if they are going to be used unstuccoed. Add a UV absorber to prevent/slow degradtion of plain blocks in sunlight. A spray of disolved styrofoam, carbon black would work. A second coat with a pastel mineral would improve appearence. I would suggest compacting the blocks enough to get the density up to about 10 lbs per cubic foot. This would still leave them at about R3 per inch. Mold the blocks 16" tall x 12" wide x 4 feet long. This would make for a 5+ cubic foot block taht would weigh about 50 lbs. This would be easy to work with. You would need a make a different slab structure for roofs. There are designs for styrofoam insulated panels that can be applied to conventional roof trusses, but these have a lot of wood in them. May be better to put a conventional roof on them. The building trade is very conservative. Mistakes tend to be expensive and stick around. Building codes are slow to change with good reason. Google the fires caused by aluminum wiring, and by early Pex heating connectors. 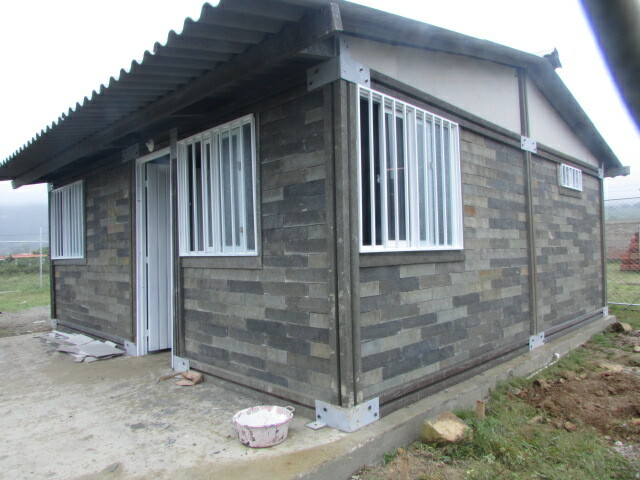 The initial use for these blocks could be for utility sheds. Market them through farm supply stores, as in many areas farm buildings are not subject to building code. The other market, once you work out the techniques, would be to cities to build up a supply for emergency housing. The ideal production facility would fit on a train. This would allow municipalities to build up a small mountain of styrofoam, then the train would come in and process it. This removes long distance trucking from the equation, and lets any municipality that can afford to the garbage sorters to play. Styrofoam is very flamable, and the fumes are toxic. In most building codes it cannot be left uncovered, but has to be covered with a material to fireproof it -- essentially the equivalent of a half inch of gyprock. In some cases OSB is considered sufficient for external walls. The material may expand and contract with temperature changes. This may make it unsuitable for applying materials like stucco and plaster unless they have extensive elasticing agents (latex, usually) added. Some of the lime based plasters may work, as they tend to deform more gracefully, as may earth plasters with emulsified asphalt as a binder. The wall is very fairly light. At 10 lbs per cubic foot the unplastered wall would only weigh about 80 lbs per linear foot. Styrofoam is not very strong in tension. It's not clear how this would affect the building in heavy wind or earthquake. It would probably be necessary to tie the roof to the foundation in some way. The low density and fairly low strength would require very large fasteners to distribute the load over large areas. Adding some form of long fiber to the mix may increase it's tensile strength. Hemp or flax hurds? A wall as described would not be secure. A chainsaw could go through it with ease. However this is true of conventional stick frame construction too. An alternative construction system is Logix, by Beaver Plastics. There are several other similar systems. In this sytem, you have blocks of styrofoam with channels in them. Think styrofoam concrete blocks. The channels are filled with concrete, after re-bar is placed. The use of rebar and concrete makes the embedded energy cost of the wall fairly high. There is no reason that this system couldn't use recycled styrofoam as its feed stock. It's definitely possible to recycle plastic and create LEGO-like building blocks. In fact several houses have already been built this way! In 2010 a Colombian architect called Oscar Mendez had the same idea as you. He started an initiative called Conceptos Plasticos (website in Spanish) with the goal to reduce both waste and extreme poverty by providing cheaper and better housing solutions for people in need. 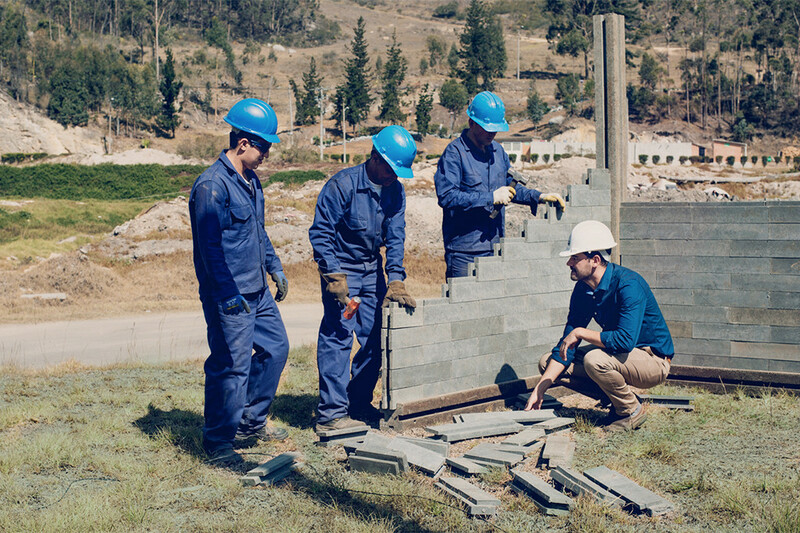 The plastic waste we recycle is melted and poured into a mould to produce plastic blocks that work like Lego pieces, allowing whole communities and families to play a part in the easy constructing of their own homes. The materials contain additives that makes them resistant to fire and because the structure is plastic-based, it is earthquake resistant. One critical remark though; I haven't seen any information which types of plastic are used for creating the bricks, so I'm not 100% sure all types of plastic are recycled. Not the answer you're looking for? Browse other questions tagged recycling plastic insulation construction or ask your own question.